Which Jukebox Blessings should I listen to? Choosing which Blessings to listen to is simple. If you are new to Dr. Dan and Holy Divine Healing techniques, it is suggested you begin with the first Blessing, and proceed in the order they are listed. For those more experienced, choosing the Blessings is left to your intuition. As you read over the names and descriptions of each Blessing, you will feel drawn to certain ones over others. These are the Blessings you are ready for. Blessings are very powerful experiences and you will want to allow some time to fully absorb them and the changes that will occur. How do I access a Jukebox Blessing? When you have chosen one or more Blessings, you can checkout with PayPal. If you are not logged in, or have not yet created an account, you will be prompted to do so. The purpose of the account is to be able to return to the site and access the Blessings for the full three days. Once you have completed a purchase through PayPal, a media player will appear within the panel for that particular Blessing. You can start and stop the Blessings and set the volume using the icons on the media player. When listening to a Blessing, select a quiet environment where you will not be disturbed. The best experience is achieved with headphones. DO NOT LISTEN TO BLESSINGS WHEN DRIVING OR OPERATING MACHINERY. The Lectures are a short introduction to Dr. Dan Mathews and Holy Divine Healing. Dr. Dan will talk about what has been achieved since the last Group Healing, and discuss what is currently happening. Guests are invited to mingle and ask questions. After a short break, the Group Healing will take place. Dr Dan will ask one or more volunteers to represent the group and he will use leg length evaluation to ask the will of the Indwelling Holiness to determine what Blessings will be used that day. Group Healings usually last about an hour. The healing is for the collective of humanity and the blessings that come through are determined by the unique gifts of those attending. Your presence makes a difference! For those unable to come to the Group Healing in person, a toll free number will be provided to allow callers to listen in on the Lecture and the Group Healing. Private, individualized sessions are about 30 minutes, and are available by appointment. Appointments are best made in advance, as Dr. Dan often has a full schedule by the time he arrives. While the Lectures are free of charge, a minimum suggested love offering of $35 per person is requested for the Group Healing. The minimum suggested love offering for Private sessions is $85 to $148. Please contact a local host to make reservations and payment arrangements. Who is Dr. Dan Mathews? Dr. Dan Mathews trained and worked as a chiropractor in the early 90s when he "evolved" into Holy Divine Healing through a heat stroke that took him to "the other side of the veil." During this experience he was given the capacity, dates and information for bringing in the new paradigms leading up to the 2012 shift. His work now supports our transition into the Golden Age. Dan has an exceptional and rare perception of human spiritual evolution. In addition to being a chiropractor, he is an ordained minister in the order of Melchizedek and a humble servant of the living God that beats our hearts. What is Holy Divine Healing? We were all Holy Beings long before we were human beings. We enjoyed perfect health, we lived abundantly in love and joy, and we functioned in harmony with all of life. We became separated from this Holy Being state when our matrix of life was fractured and fragmented, creating the problems that are so prevalent in the world today. Holy Divine Healing is a healing process orchestrated by our Inner Holiness that restores us to our Divine Perfection. It repairs this fragmentation. It reconnects us with the knowing of our Inner Holiness. It heals the damage caused by this separation. And it gives us the tools we need to create and experience the beauty and magnificence of life as a Holy Being of Knowing Consciousness. Holy Divine Healing is a process of energetic transformation. We are, at our very essence, tiny particles of vibrating energy. This energy is organized into form, and the reality we experience, by a complex series of geometric matrixes. These matrixes hold the factors in place that form our reality and our life experience of it. We can heal and evolve any aspect of our life by changing the matrix that forms it. This is how Holy Divine Healing works: by repairing and replacing the energetic matrixes that form us, our reality, and our life experience. Holy Divine Healing utilizes sacred geometric equations to create a new matrix of a higher order. The sacred geometric equations are Crystal Light Blessings given by the Holiness of Life that dwells within us all. The Blessings are multidimensional and work differently on each individual. These Blessings spontaneously heal our physical and subtle body structures and create the morphic field that allows for new life expression of a perfected and Holy order. This is the etheric architecture of The Holy Being. The Crystal Light Blessings are issued through a Divine Decree that activates and engages your own Inner Holiness. The Blessings are placed into your matrix through the spoken word and the etheric transmission of energy. These Blessings speak to your Inner Holiness and work with your Inner Holiness to heal and evolve your matrix. This healing occurs at a level of awareness that is beyond mortal comprehension. You do not need to have a mental understanding of this process. All you need to do is have a sincere intention to heal and grow. Your Inner Holiness will take care of the rest. I offer 15 Blessings for you to choose from. Each of these Blessings works with and builds upon the others and is an integral part of your healing and return to a Holy Being state. You may choose which of these Blessings is right for you, through your intuitive process, or you may choose to do them all. I recommend that you relax and listen to the Blessings in a quiet, meditative state, and then treat yourself with loving kindness as you integrate the energetic changes. In addition to the Blessings, I recommend that you practice the Parable of Christ Consciousness daily. This is a simple invocation which brings forth the Knowing Consciousness of your Inner Holiness to lead and direct you in your life and assist with your transformation. 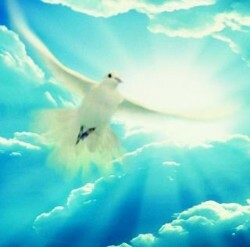 You may learn more about the Parable of Christ Consciousness at www.livetheparable.com. Thank you for choosing to heal yourself, for when we heal ourselves…..we heal our world. May your journey to wholeness be Holy and Divine. I knew how important Holy Divine Healings were to my physical rewiring when, a few hours after my first treatment with Dr. Dan, a golden beam of light came through my ceiling with a sonic boom and went straight into my heart. As my heart was palpitating, I remember exclaiming to myself, “Wow, Dr. Dan, you didn’t tell me this would happen!” Joy entered my physical body that day. Ten years ago I took my step in Trust when an appointment with Dr. Dan opened up…and every step since has been a Blessing~! Whatever healing-personal growth work I pursue, Holy Divine Healing is a catalytic boost for my spiritual, emotional, mental and physical evolution. Working at causal levels, HDH naturally and powerfully heals ‘glitches’ in the effects and enjoyment of my life. Issues, reactivity and limitation disappear, liberating Energy, Awareness, Love and Joy~! Trust what brought you to this opportunity….allow your mind to relax and your Inner Knowing to guide this profoundly productive and fulfilling experience….of you~! Dr. Dan is consistently authentic, kind and caring and he is completely devoted to his sacred path. I really learned to trust spirit and life by being around him. I am extremely grateful to have him in my life and happily recommend his Holy Divine Healing to anyone wanting to heal the past easier and move into creating their life with more joy. I have been very blessed to meet, know, and work with Dr. Dan Mathews for about 11 going on 12 years now. When he first came to New Mexico to share his gift of Holy Divine Healing (first through demonstrations and individual sessions and then adding group healing events), I couldn't begin to rationally understand the "blessing language," or "equations of life" he was using, but I felt the profound transformation in my heart and immediately understood the six step daily prayer for living the parable of Christ Consciousness. After a few months of practicing this simple prayer to accept, forgive, surrender, yield, trust, and ask for guidance, I began receiving inner guidance to create my personalized version of the prayer (some may experience an inspired change for the prayer in just a few weeks). My prayer continues to transform as I expand and awaken to new ways of Being in the world but not of it on this amazing Journey Home together. Androgyne: Our Holy expression in perfect masculine and feminine wholeness and harmony. This is the highest state of our spiritual expression. Ascension: The process of returning the fragmented parts of our Being to wholeness. Atlantis: An ancient enlightened civilization. It is one of the three original Holy O civilizations. Chakras: Energy centers in and around the human body. Crystal Lattice: The matrix of our Holy Spirit which holds all records from the dawn of creation. Crystal Light Blessings: The equations of Holy Divine Healing. These are Divine Decrees orchestrated by our Inner Holiness. Crystal Light Body: Our Holy O Crystal Light Body is our original expression of our soul. Crystal Pyramids: The transmitters of consciousness from our gut awareness (our intuition). Crystal Temples: The origins of Knowing Consciousness. Divine Decree: The creator of Divine Reality. Divine Perfection: Our Holy state. Etheric: The layer of the human energy field that sustains organic life. Fractal: A geometric expression, or measure, of the physical world. Great Seal of the All Knowing: The authority of the Divine Presence. Holiness of Life: The combined in-dwelling Holiness of all. Hologram: The expression of all aspects of Divine Presence, expressed as an image in which each part contains the whole. Holy Being: A whole being of infinite potential with the Knowing Consciousness of its Inner Holiness. A Holy Being is a being of a Holy O hologram, fractal and microcosm. Holy Divine Healing: A process of healing orchestrated by our Inner Holiness. Holy O: The perfected expression of life, expressed simultaneously as a geometric shape (the circle), a number (the number zero), and a letter (the letter “O”). Human Being: A fragmented being of limited consciousness and potential that suffers the condition of self (a belief consciousness in the programming of outer world authority). Hyperboria: An ancient enlightened civilization. It is one of the three original Holy O civilizations. Inner Holiness: The Divinity that resides within each of us and which is brought forth through practicing Christ consciousness. Knowing Consciousness: Our Divine Awareness. Lemuria: An ancient enlightened civilization. It is one of the three original Holy O civilizations. Levels of Consciousness: Levels of awareness. There are seven levels of consciousness: unconscious, subconscious, conscious, mass conscious, Christ consciousness, cosmic consciousness, Goddess (Androgyne) consciousness. Light Rays: A band of protons that precipitates awareness. Macrocosm: The largest structure of reality. Matrix: The form that holds the factors in place that create reality. Merkabah: A geometric vehicle of the expansion of consciousness. Microcosm: The smallest structure of reality. Migleomaglous: The sacred portal of Divine Intervention. Morphic Field: The field of life. Multidimensional: A measure of awareness involving three or more dimensions of reality. Nine Clusters of the All That Is: The big picture of life organized into a matrix of nine clusters of creation. Oniverse: A Holy O structure of reality that contains 763 cosmos with 15 galaxies in each cosmos. Parable of Christ Consciousness: A multidimensional invocation of our Inner Holiness. Paradigm: A reality of consciousness. Plan of Grand Design: The orchestrated efforts of our Inner Holiness to create O-ness (wholeness) in our life. Portal: An entryway into another dimension or paradigm. Pulses of Creation: The motions of creation that initiate and sustain life. Sacred Geometric Equations: The equations of Holy Divine Healing. A Blessing of Divine Decree that expresses creation into geometric form. Sacred Geometry: The intelligence that orders creation into form. Self: The human condition operating from belief consciousness in response to outer world authority, as opposed to the Knowing Consciousness of its Inner Holiness. Soul: The physical density of our flesh body. In our Divine Form, it is our Divine Masculine. Spirit: The integrator of our seven levels of consciousness and the origin of all bodily systems. Star Gate: An entryway into a specific origin of creation. Subtle Body Structures: The etheric expressions of our being. Trinity of O-ness: The merging of our Holy O soul, spirit, and presence with another’s. This allows us to understand each other’s thoughts and feelings and share our knowing. It creates total integrity, honor, and high regard for one another. Underworlds: The components of our unconscious that create our nature. What happened in 2012? And what will happen next? The times... They are a changing! As an individual learns and develops over time, evolving from a blank slate into a conscious human being through experiences such as school, relationships, challenges and etc, certain milestones are reached and noted, such as a graduation day or a wedding day. In similar fashion, humanity evolves, and the milestones, or paradigms, can be represented as "Crystals". What is the Christ Consciousness Prayer? When Dan was on "the other side" he was given the message that a primary reason for our existence was to learn to trust our Indwelling Holiness, which is to live in trust, to live in Christ Consciousness. This is the prayer that Dan was provided to support this. If you will say it daily upon rising it can change your life for the better in as short a time as two weeks. I accept all issues in my life as my own and I forgive myself for all negative experiences and any harm caused. I now surrender all worries, problems and concerns in my life to you as I yield to your will in my life. I take my next step in trusting you without having to understand what is around the next corner. I ask you for guidance. Please show me the way.